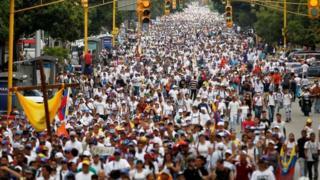 Thousands of Venezuelans dressed in white marched in silence to remember those killed in three weeks of protests against the government of President Nicolas Maduro. In Caracas, some protestors were initially blocked from reaching the office of the Roman Catholic archdiocese but then let through. Marches to Episcopal offices took place in cities across the country. The opposition blamed the police and militias for the deaths of 20 people. Image caption Lilian Tintori, wife of a jailed opposition leader led one of the Caracas marches. The protests began after the government-backed Supreme Court tried to strip some powers from Congress. Image caption One opposition legislator, Miguel Pizarro said on social media that the march "shall be a thundering and historic silence that beats on the conscience of the oppressor". Image caption Supporters of Venezuela's President Nicolas Maduro held their own demonstrations as opposition activists tried to march towards the Catholic Church's Episcopal seats nationwide. Image caption During the last protests on Thursday at least 11 people were killed from either electrocution or gunfire during looting and clashes between government opponents and the National Police in Caracas.